Just in time for Earth Day! 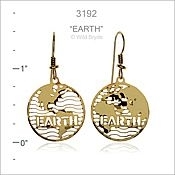 Our brand new Earth Day Earrings are featured here in 14k gold-plate with 14K gold-filled earwires. Also available in a rhodium (silver) finish with sterling silver earwires.